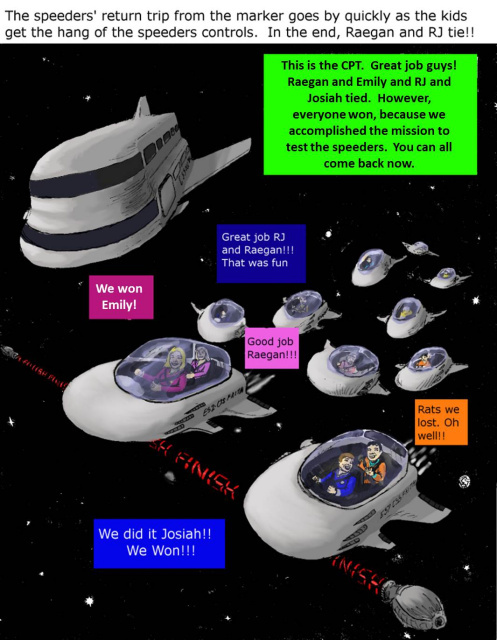 Amazing Raegan and RJ in Space Art! 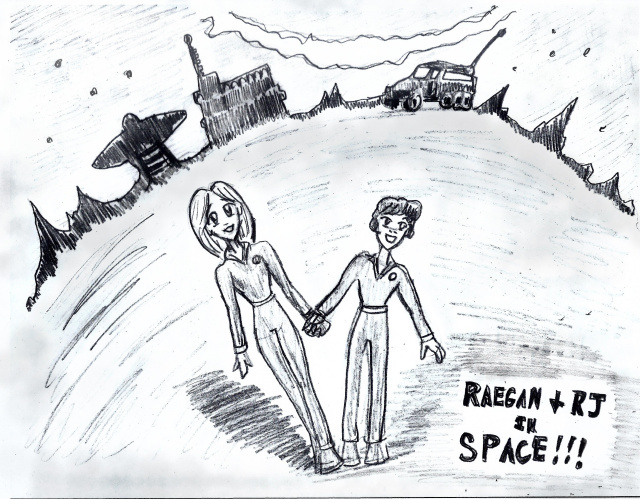 Check out these amazing drawings of "Raegan and RJ in Space!" Amazing Art by Bushell Media! Hi everyone. 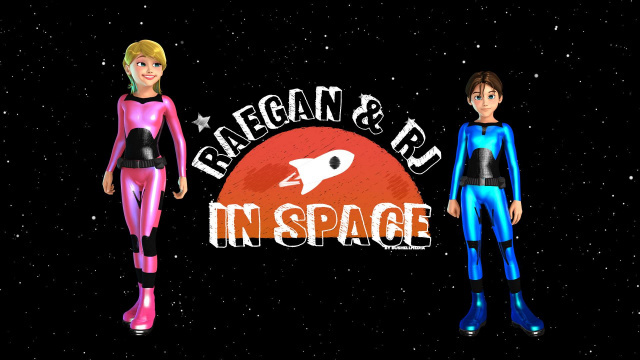 Here is a picture of Raegan and RJ in their space suits done for us by an animation company called Bushell Media! Awesome job guys! You can see other amazing products by Bushell Media at their YouTube Channel here: https://www.youtube.com/user/TheFaithKids/videos Woo-hoo! Go Raegan and RJ in Space! 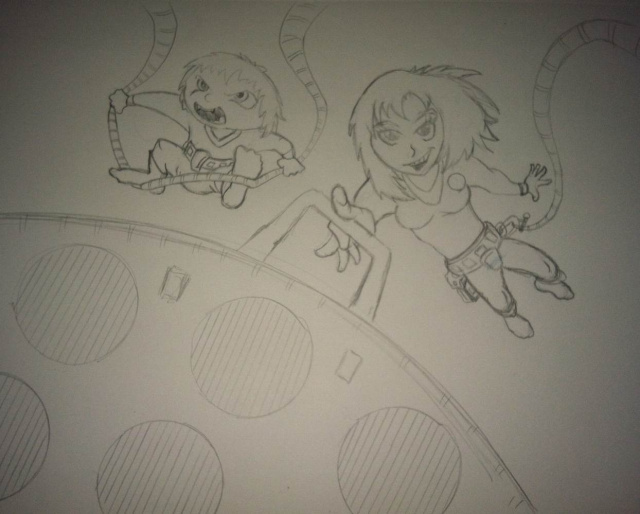 This amazing art was done by Olivia Arrington of Virginia~ In this awesome action picture Raegan and RJ are hovering through space using the newest technology, a space board and space glides, to help them travel to new dimensions on their many adventures! 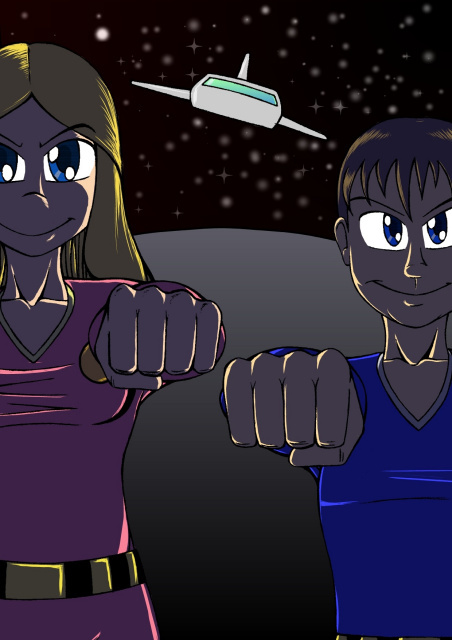 If you want to see more art by Ms. Arrington, just go to her awesome web site : http://olivia90.wix.com/oliviararrington Great job Ms Arrington, this action picture really catches the feeling of Raegan and RJ! Go Raegan and RJ in Space! This amazing art was done by Mr Robert Stimpson of Colorado. 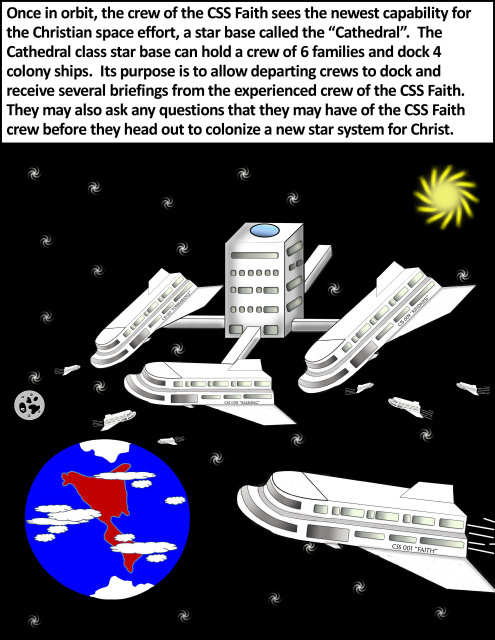 It is a drawing of the CSS Faith arriving at Alpha Centauri! 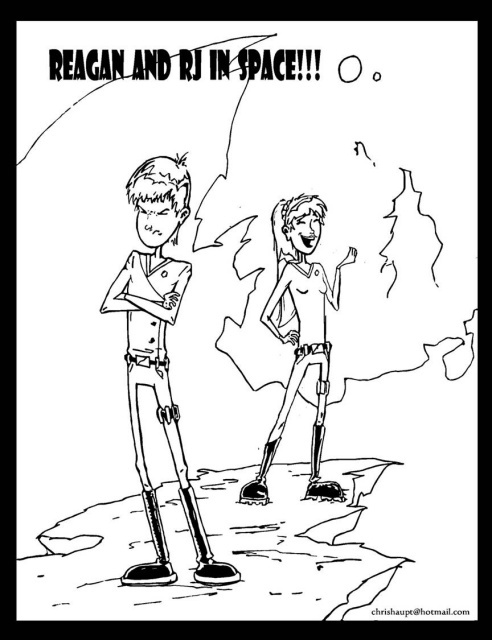 It is not colored because it is going to be in a R&RJiS Coloring Book! Isn't that cool! To see more of Mr Stimpson's work please visit his web site on-line at http://artofrstimpson.blogspot.com which has amazing portraits of Jesus and awesome sayings. Mr Stimpson can also be reached online through the Christian Comic Arts Society (CCAS). Totally amazing! This amazing art was done by Mr Robert Stimpson of Colorado. It is a picture of the CSS Faith arriving at a solar system to explore with an amazing water planet, and also a great portrait of Raegan and RJ in their space suits. This is just amazing we have never seen this artwork type before. The details in both the ship, planet, and space suits are out of this world! To see more of Mr Stimpson's work please visit his web site on-line at http://artofrstimpson.blogspot.com which has amazing portraits of Jesus and awesome sayings. Mr Stimpson can also be reached online through the Christian Comic Arts Society (CCAS). Totally amazing! This amazing art was done by Mr DL Maffett of Georgia USA. It is called 'Retro RJ'. This is so cool!! Awesome!! This amazing art was done by Ms. Laura Tisdel of Massachusetts. 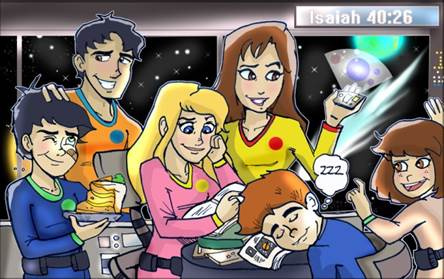 It is a picture of Stanley, Joseph, Raegan, Olivia, RJ, and Ella in a study session on the star ship. This art is amazing. Look at the expressions and poses of the characters - they are so life-like. Without a doubt this is one of the best 'amazing art's' we have seen. It is amazing!!! Ms. Tisdel describes the scene she drew as "the kids are either studying (or eating carrot cake). RJ fell asleep while doing his homework. Ella is the only one who notices the distant comet coming as she tries to get everyone's attention." Wow she is an awesome artist. To see more of her work please visit her web site at www.lltisdel.com which has a lot of her illustrations and is kid-friendly!! Ms Tisdel can also be reached online through the Christian Comic Arts Society (CCAS). Amazing! These 2 amazing art drawings were done by Mr Chris Haupt of Miami, Florida. They are pictures of Raegan and RJ exploring a planet in another solar system! Don't you love them? The expressions on the faces and other details are amazing. They really look like they are on other planets. To contact Mr Haupt, or see more of his work, he can be reached online through the Christian Comic Arts Society (CCAS). Don't you love these? This amazing art was done by Mr. Ben Mullins of Tennessee. Isn't it awesome? 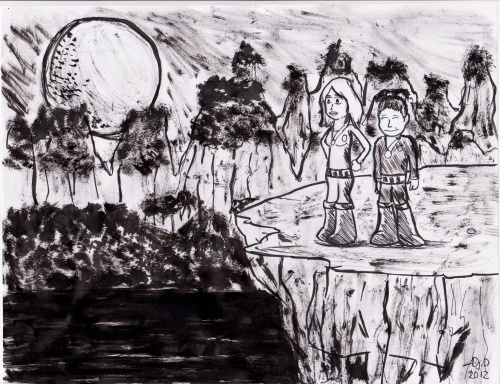 It is a picture he drew of Raegan and RJ on another planet and a great view of their shuttle in the back ground. He has an awesome style!! To contact Mr. Mullins, or see more of his work, he can be reached online through the Christian Comic Arts Society (CCAS). He also displays some of his artwork at the followning web site: http://cartoonistmusician.wix.com/elc if you want to go look at it. 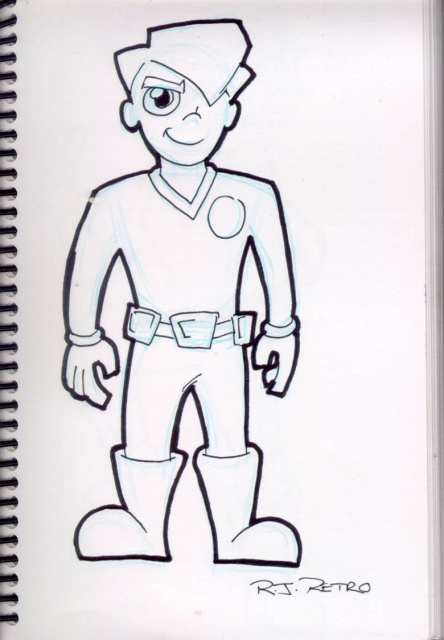 At this web site he shows some work from his upcoming comic story he is working on called 'The Extraordinary League of Christianity', and he has some very cool character sketches drawn. Amazing! You can tell this art took alot of effort and time to do. Awesome. Check this out!! This is a picture of a kids bedroom done by Mr D.L. Maffett of Georgia which has a poster of a 'Raegan and RJ in Space' adventure hanging up on their wall! Isn't it amazing? To contact Mr. Maffett or see more of his work he can be reached online at the Christian Comic Arts Society (CCAS). AWESOME!!! This amazing art was done by Mr. D.L. Maffett of Georgia USA. 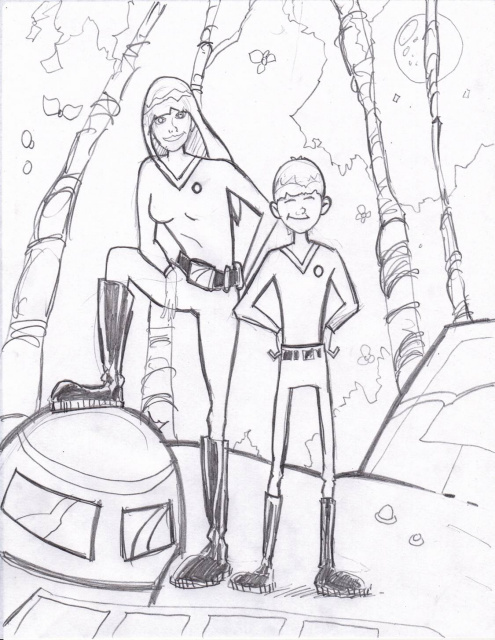 It is the sketch work that was done for the cover art for the latest adventure called "Raegan and RJ in Space: The Deepening Sea". Isn't it amazing? 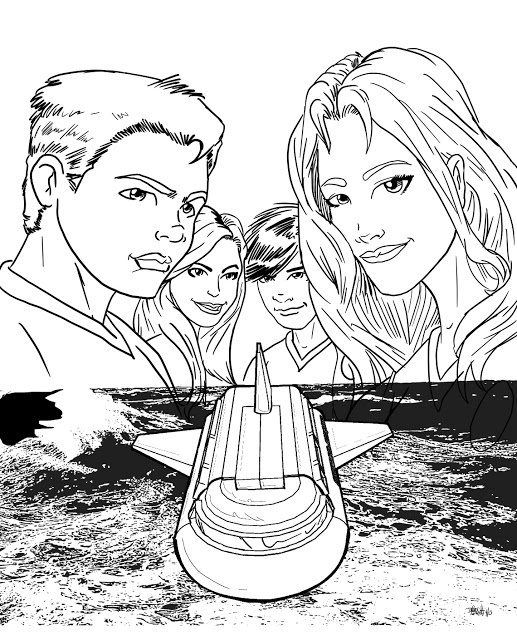 It is a picture of Raegan and RJ and their best friends May and Jonathan on Barnard's Star above the sea, and the shuttle heading underneath to figure out how to stop the siezmic shifting and falling sea floor! This artwork was turned into the full color cover that was published! To contact Mr. Maffett or Mr. Armstrong or see more of their work they can be reached online at the Christian Comic Arts Society web page (CCAS). This amazing art was done by Mr. D.L. Maffett of Georgia USA and Mr. Donald Armstrong of Canada. Amazing!!!!!!!! This is the sketchwork that became the full cover to 'Final Mission'. 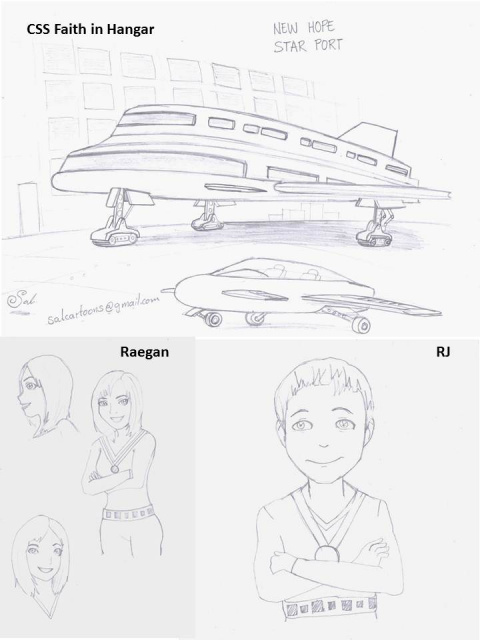 This is the sketch work where Mr. Maffett was trying to figure out how to depict a grown up version of both Raegan and RJ for the 'Final Mission' cover done by Mr. Maffett. Isn't it amazing? 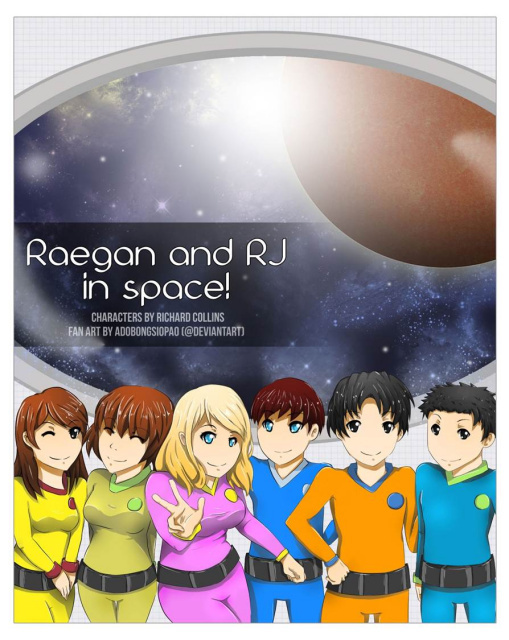 It is the cover art for the latest adventure called "Raegan and RJ in Space: Final Mission". These sketches turned into the final amazing cover! To contact Mr. Maffett or Mr Armstrong, or see more of their work, they can be reached online through the Christian Comic Arts Society (CCAS). This amazing art was done by Mr. D.L. Maffett of Georgia USA. Amazing!!!!!!!! 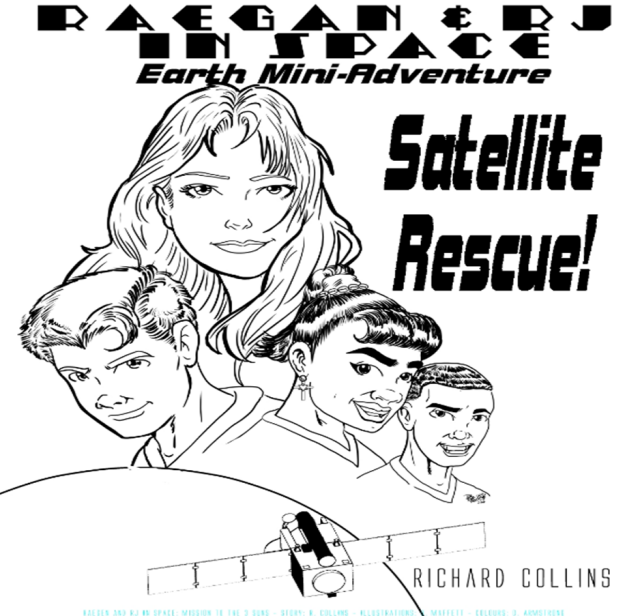 It is the cover art that became the full color cover for 'Satellite Rescue'. 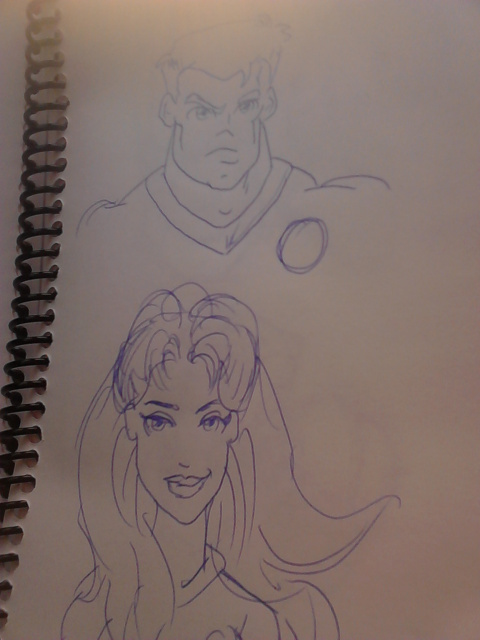 It is a picture of Raegan and RJ, and two new characters Imogene and James who are in the story! 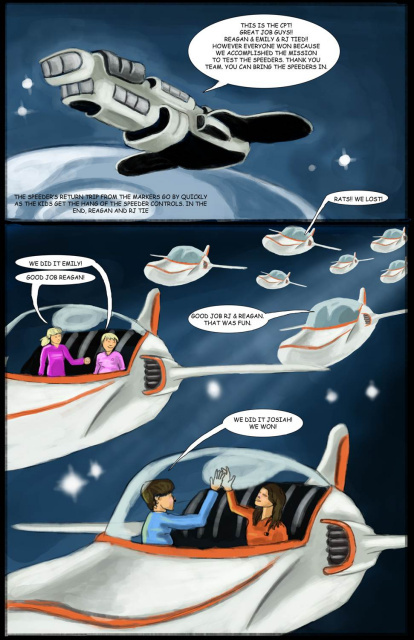 It also has a picture of the Earth and the satellite that is going to hit Washington D.C. To contact Mr. Maffett or Mr Armstrong, or see more of their work, they can be reached online through the Christian Comic Arts Society (CCAS). This amazing art was done by Ms. Paula Richey of South Carolina. 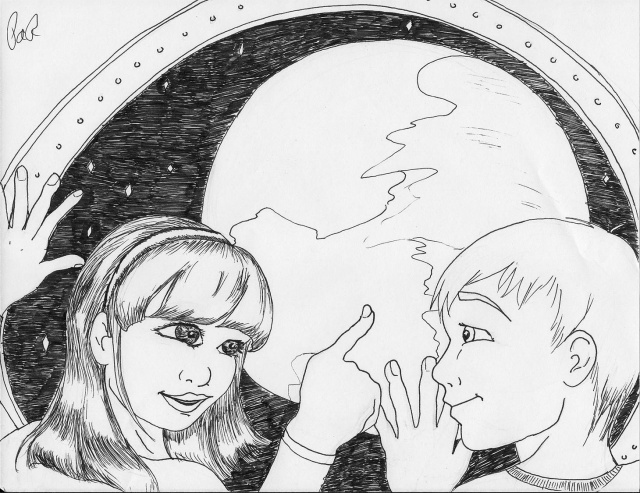 It is a great drawing of a very young Raegan and RJ looking out the porthole of their space ship at a planet they are arriving at. Isn't it awesome? This sketch is amazing. The artist thought it would be great to print out and have kids color in. We do too! Thank you Ms. Richey for sharing your vision of Raegan and RJ with us. It is amazing! To contact Ms. Richey, or see more of her work, she can be reached online through the Christian Comic Arts Society (CCAS). You can also send her an e-mail at aponiwriter@yahoo.com . Ms. Richey also has a website she dislays her awesome artwork at http://www.otherrealmstudio.com please go look at it. Awesome! This is cool. Mr D.L. 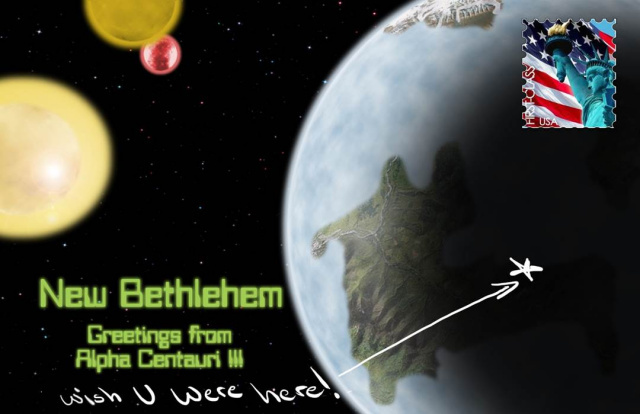 Maffett of Georgie created a post card that Raegan and RJ would send to friends back here on Earth from Alpha Centauri! Isn't it amazing! Woudln't it be cool to get a post card from Raegan and RJ? Awesome idea! This amazing art below was done Mr D.L. Maffett of Georgia - and it is a sketch of Olivia, Ella, RJ, Raegan, Joseph, and Stanley all in there space suits and utility belts. 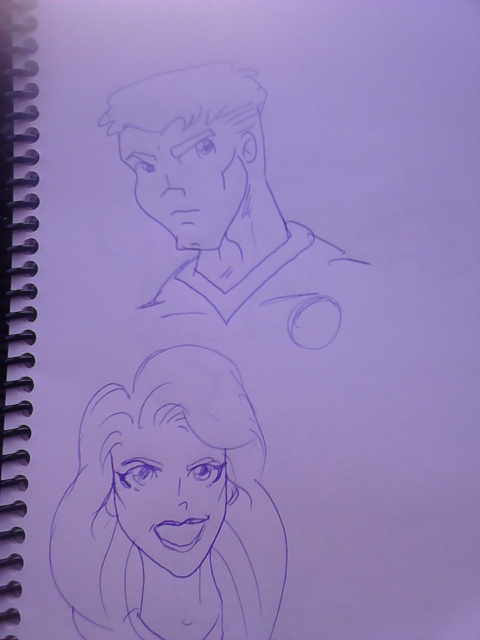 These kids look soooo cool the way Mr Maffett draws them. 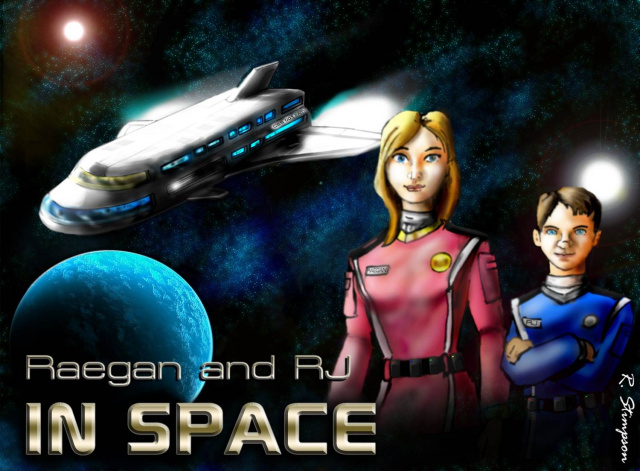 Go Raegan and RJ in Space! To contact Mr. Maffett or see more of his work, he can be reached online through the Christian Comic Arts Society (CCAS). Amazing!! This amazing art was done by Mr. Christopher Lebeau of Georgia. 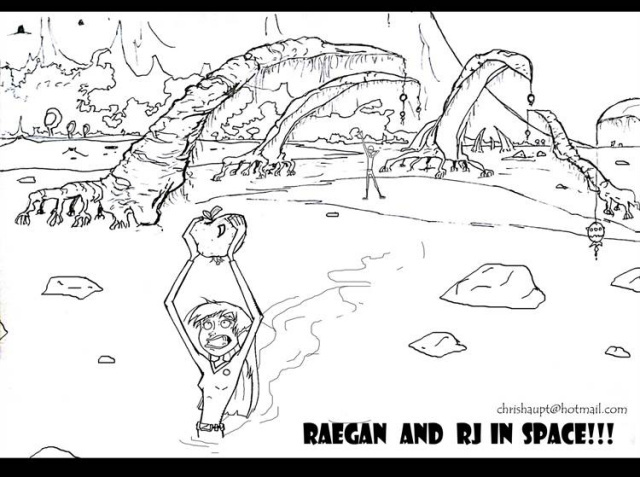 It is an awesome amazing sketch of RJ and Raegan on a space adventure! This is great. To contact Mr. Lebeau, or see more of his work, he can be reached online through the Christian Comic Arts Society (CCAS). This is a cool sketch unlike any have submitted before! It looks like a type of cartoon sketch that would be on cartoon network. This is great! This amazing art was done by Mr. D.L. Maffett of Georgia. Awesome. 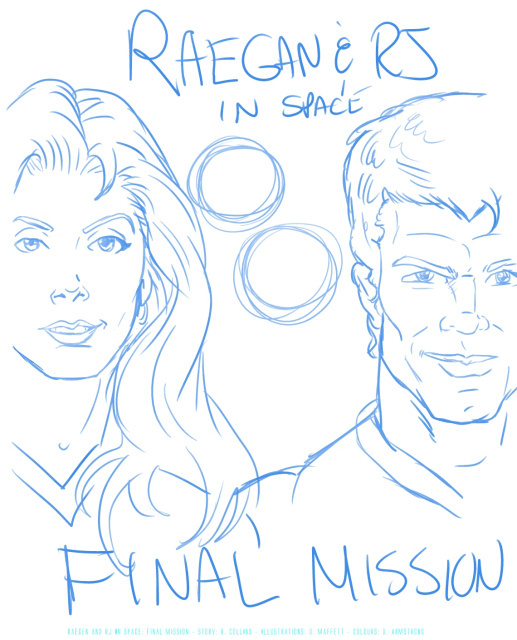 It is the sketch work that was turned into the full color cover for 'Mission to the 3 Suns'! Isn't it amazing? 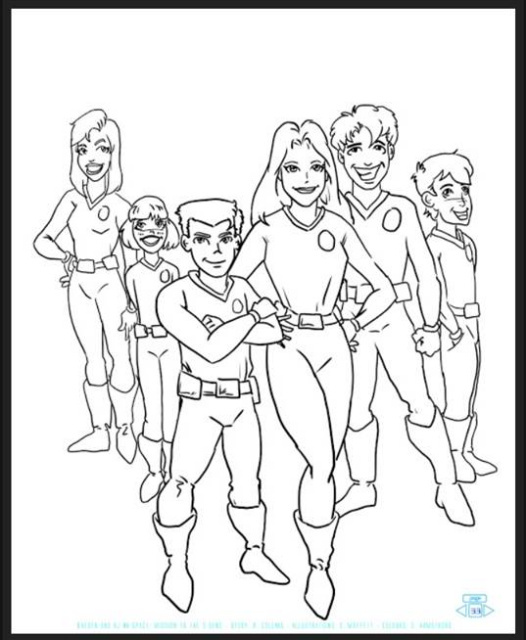 It shows a picture of Raegan, RJ, Stanley, Joseph, Olivia, and Ella, the six kids who go on the 'Mission to the 3 Suns' in their space suits. To contact Mr. Maffett and Mr Armstrong, or see more of their work, they can be reached online through the Christian Comic Arts Society (CCAS). This amazing art was done by Ms. Candace Nunn of Lafayette Indiana! It is an awesome pencil sketch of Raegan in her space suit and she also has her utility belt on. Isn't it amazing! To contact Ms. Nunn, or see more of her work, she can be reached online through the Christian Comic Arts Society (CCAS). Amazing! Isn't this a great sketch of Raegan? This is a great one! Thank you Ms. Nunn for sharing your vision of Raegan with us! This amazing art was done by Mr. Jim Gullett of Gresham Oregon. It is a great portrait of RJ and Raegan. 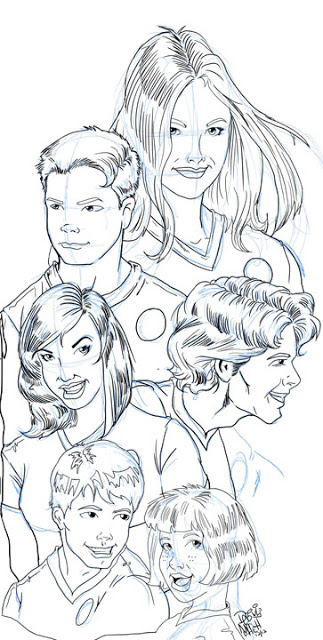 To contact Mr. Gullett, or see more of his work, he can be reached online through the Christian Comic Arts Society (CCAS), or at his his e-mail address jimgullett@yahoo.com to send him a message. Awesome work! This amazing art was done by Mr. Brien Sparling of Monterey California. 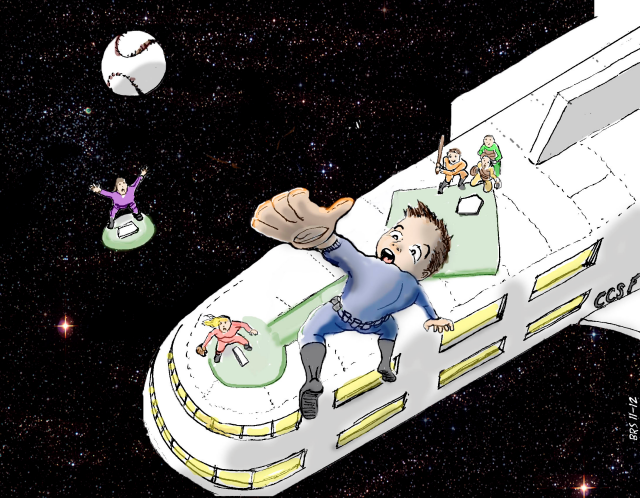 It is titled 'Spaceball' and is a picture of Raegan and RJ and their friends playing a version of our game baseball in space. Isn't it awesome! This is great work and very creative at the same time. Mr Sparling has done an awesome job showing the characters in action! To contact Mr. Sparling, or see more of his work, he can be reached online through the Christian Comic Arts Society (CCAS), or at his his e-mail address abalon_comic@hotmail.com to send him a message. This amazing art was done by Mr. Brien Sparling of Monterey California. 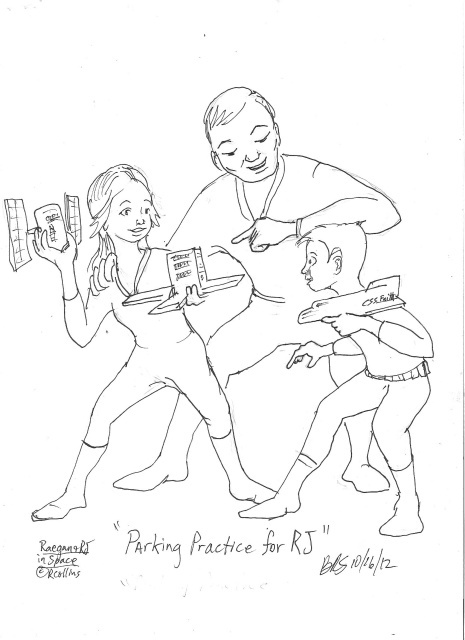 It is titled 'Parking Practice for RJ' and is a picture of Raegan, RJ, and Captain Collins practicing landing the CSS Faith Star Ship. This is another sketch where he shows action. This is excellent! To contact Mr Sparling, or see more of his work, he can be reached online through the Christian Comic Arts Society (CCAS), or at his his e-mail address abalon_comic@hotmail.com to send him a message. This amazing art was done by Mr Todd Melchizedek of Maryland. 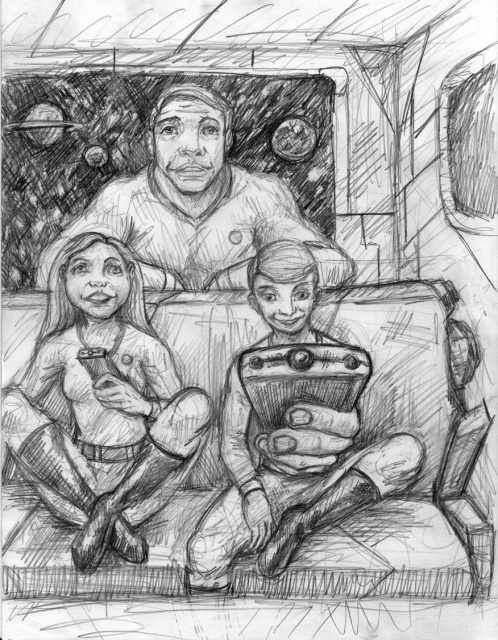 It is a picture from Book 1 where Raegan and RJ are playing video games in their living room on the star ship CSS Faith enroute to Alpha Centauri! This one is great! He can be reached online through the Christian Comic Arts Society (CCAS). He is the author of several online comics, one about a young girl named Cara who learns about Jesus called "Cara and the forever friend", and another story about a fighting angel. He has a website at weaponpress.com where he displays some of his work. This amazing art was done by Mr. Gerard Lee of Hawaii! This is a picture of Raegan and RJ on another planet. This artwork is too cool! Mr Lee can be reached online at the Christian Comic Arts Society (CCAS), and also has a website where he has displayed some of his work here at http://www.theedgeoftheflock.com/home and also here at http://www.angellitecomics.com/ if you would like to visit it. The following amazing art was done by Mr. Salvador De La Paz of Mexico. 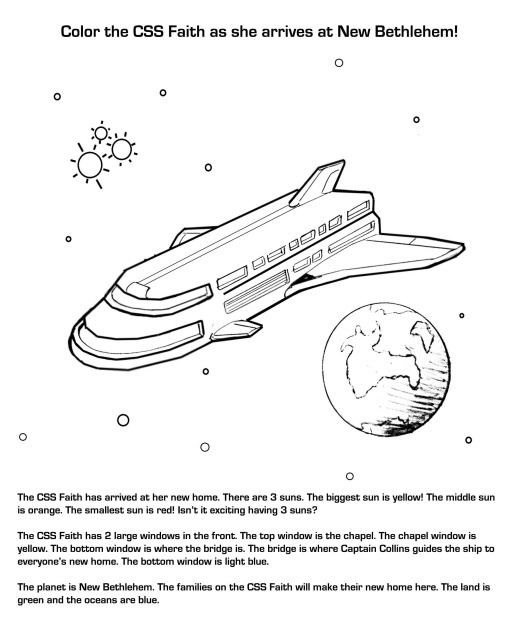 It shows Raegan and Rj in the star ship hangar in front of the CSS 001 Faith Christian Star Ship. Isn't it amazing? To contact Mr. Paz or see more of his work go to elance.com on the world wide web. Here is the sketchwork that went before the above artwork. Isn't Mr Salvador De La Paz awesome! The following amazing art was done by Mr. Salvador De La Paz of Mexico. It shows his vision of the speeder race which took place in book 1. Raegan and Emily are in one speeder in front and RJ and Josiah are very close behind! To contact Mr. Paz or see more of his work go to elance.com on the world wide web. The following amazing art was done by Mr. Vali Lancea of Romania. 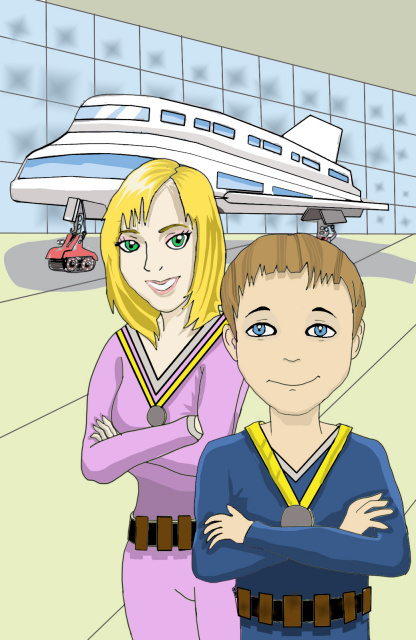 It is his vision of Raegan and RJ's speeder race in book 1. Isn't it amazing! To contact Mr. Lancea he can be reached through Elance on the world wide web. The following amazing art was done by Mr. Joe Hojnacki of the US. 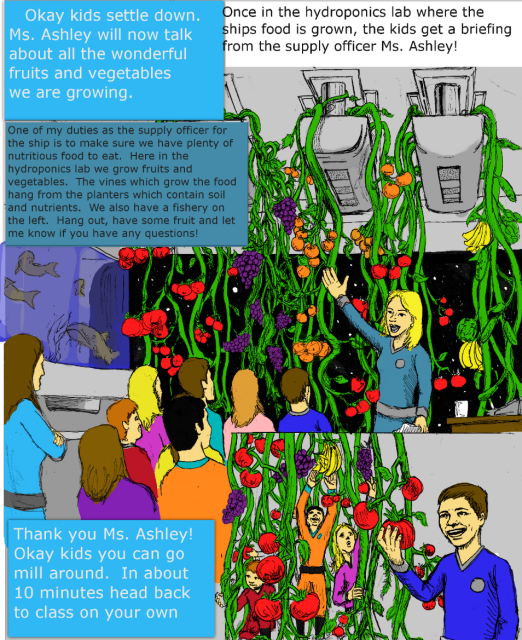 It shows his vision of a scene from graphic novel 3 where the kids visit the hydroponics lab on the star ship for a class trip. Hydroponics, the method of growing plants in water supplied by the proper nutrients, is the way fresh fruits and vegetables are grown on the star ship CSS Faith. The author included this hydroponics lab in the star ship design because he has been fascinated by the topic of hydroponics since seeing one at EPCOT Disney World as a kid in 1976. With this technique, you can grow food anywhere. To contact Mr. Hojnacki or see more of his work go to elance.com on the world wide web . The following amazing art was done by Mr. Goverdhan G. of India. 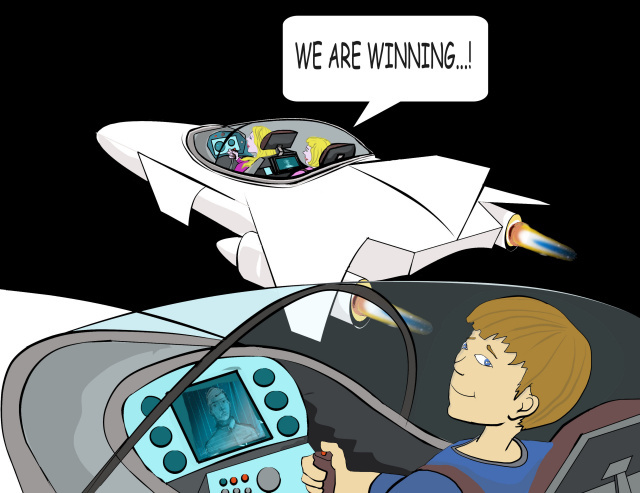 It shows his vision of the speeder race from graphic novel 1. In this scene the kids test out the CSS Faith's emergency escape speeders by having a race. This is the end of the race where Raegan and RJ tie. To contact Mr. Goverdhan or see more of his work go to elance.com on the world wide web. 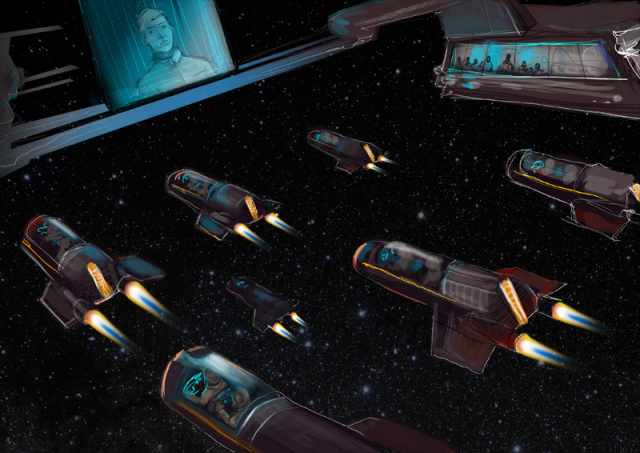 The following amazing art was done by Ms. Fanqi Z. of Italy , and shows her vision of the speeder race from graphic novel 1. In this scene the kids test out the CSS Faith's emergency escape speeders by having a race. This is the end of the race where Raegan and RJ tie. To contact Ms. Fanqi or see more of her work go to elance.com on the world wide web. .. 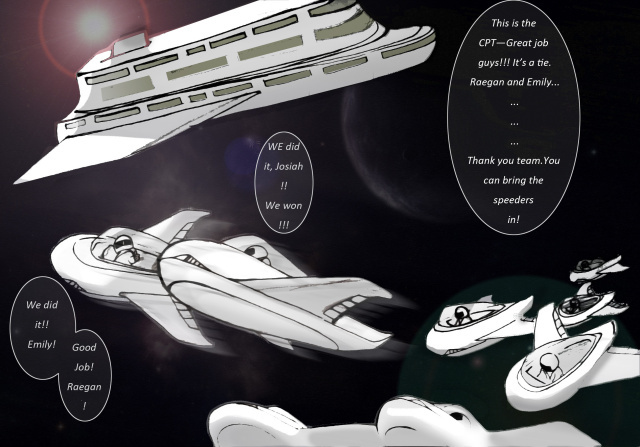 The following amazing art was done by Ms. Saima Z. of Oman , and shows her vision of the CSS Faith returning home from graphic novel 3. In this scene Raegan and RJ and the crew return to the Christian Star Base "CSB Cathedral" after 4 years colonizing other star systems. To contact Ms. Saima Z. or see more of his work go to elance.com on the world wide web .